I don’t particularly like this vase. I find the style tight and constricted. But it belongs on any ceramic greatest hits list. 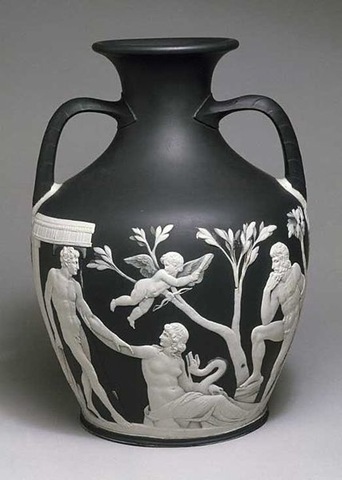 Volumes have been written about Josiah Wedgwood’s Portland Vase, c. 1790. Essentially, it’s 9½” tall with white sprigging on a black “basalt” body (one of Wedgwood’s many nomenclature shenanigans). It’s a replica, in ceramic, of a Roman cameo glass vase made around 1AD. Many have hailed it as a defining Masterpiece for both Wedgwood and England’s Industrial Revolution. Josiah Wedgwood made his name with the Portland Vase. But he made his fortunes with his ensuing “Queen’s Ware” line. That was only possible because of the technical know-how he amassed previous to making the Vase. Many potters see Wedgwood’s industrializing efforts, with their logical conclusion being today’s cheap imported stuff available at any WalMart or shopping mall, as the bane of hand made pottery. Perhaps. But there’s a flip side. Almost overnight, a wide swath of the working class could now afford refined ceramics. It was purely a marketing ploy, for sure. But before this moment, anything terribly fancy was out of reach for most people. Now the masses could aspire to have fine art in their own homes. Very few objects carry the wallop that this vase does. The Map That Changed The World. Simon Winchester. Harper Perennial/London. 2009. As usual, the Cherokee got all the credit. Since 1540, when swine flu carried by pigs of Hernan DeSoto’s expedition erased the entire Mississippian Mound Building culture in the blink of an eye, the Cherokee had dominated the Little Tennessee River Valley. They were Britain’s top trading partner in the area (until after the French Indian War, when they became the colonists’ main target for expansion). And when pottery history came knocking at the door in 1768, who got the glory? The Cherokee. The squaw saved Griffiths. But those “Strainge Copper Collour’d Gentry” drove a hard bargain. It took plenty of eating, drinking, smoking, and “Strong Talk” (and 500 pounds sterling) to get at the “unaker” clay pits. Griffiths shipped out enough material for Wedgwood to create the exact clay body needed for his masterpiece, the Portland Vase, and to kick off his fabulously successful Queen’s Ware. Bow Pottery also used this clay, still called “unaker” in Mitchell County, NC, to make England’s first true porcelain. In the shadow of the Cherokee, the Catawba, a small neighboring tribe, existed for generations. But the Catawba had one main distinction; their pottery. Other tribes made pots. The Catawba, specifically their women, were veritable ‘Pottery Indians.’ Pottery was their primary occupation. Pottery held the tribe together. And continues to do so. Cherokee families with Catawba wives became pottery families as well. Was it possible the Catawba had a hand (even a minor one) in Griffiths’ saga? It’s clear Griffiths dealt with the proud, powerful Cherokee. But Fort Prince George, the Little Tennessee River and Mitchell County roughly formed the border between Cherokee and Catawba lands. Who would best know the value of the unaker clay pits? A family married into the Catawba tradition might. The historical record falls silent. Any recognition the Catawba have garnered in recent years has been well deserved. But if they did play a part in the creation of the Portland Vase, Queen’s Ware, and England’s first porcelain, I for one would like to see that acknowledged. The Art of the Potter. Diana and J. Garrison Stradling. Main Street-Universe Books/New York. 1977).